Use the Potential Daily Reach indicator in your Campaign Settings to see how much volume your campaign is eligible to receive. What is Potential Daily Reach? 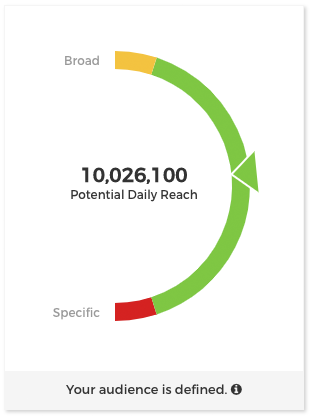 Potential Daily Reach is a feature in your Campaign Settings that shows an estimated range of maximum impressions your campaign is eligible to receive per day. This estimated impression range updates in real-time as you choose Geographic Targets, customize Platform & Device Targets, set a Base CPV Bid, and adjust your Conversion Boost℠: Quality Tiers℠ sliders. How is Potential Daily Reach calculated? Potential Daily Reach takes the total amount of available traffic across all channels and quality tiers, then calculates an estimated range of potential daily impressions based on your Geographic Targets, Platform & Device Targets, Base CPV Bid, and Conversion Boost: Quality Tiers slider positions. The targets you add and any custom bids you place on them, in addition to any blacklisted targets you add, will further refine your reach. How can I use Potential Daily Reach to optimize a new campaign? It takes time to optimize a new campaign, and getting the right amount of volume requires some adjustments. Knowing how much volume is available for your campaign before it starts running gives you valuable insight right away, so you can start profiting more quickly instead of overspending or getting too little volume. TIP: Apply the Suggested Base Bid to your campaign for a moderate amount of volume based on your Geographic Targets and Platform & Device Targets. What should I do if my Potential Daily Reach is too broad? A broad reach isn't always a bad thing. For example, if you're creating a campaign to market a new offer for the first time, you'll likely want a broader reach so you can discover what type of traffic converts best. As you identify these performance insights over time, you can make adjustments that refine your reach to the highest converting traffic. Even if your Potential Daily Reach is broad, your campaign can still be narrowly targeted depending on your targets, custom bids, and other traffic-related settings. What should I do if my Potential Daily Reach is too narrow? After you've spent some time marketing an offer, you may want to create additional, more targeted campaigns to more granularly optimize performance for that offer. For example, if you find certain device types convert well in certain countries, you may want to target only those device types and countries in a separate campaign with higher bids. In cases like these, your Potential Daily Reach may be too narrow to get volume, so you'll want to move your quality tier sliders to the right to bid more competitively for more traffic. My Potential Daily Reach is broad, but I'm still not getting much volume. Other settings like frequency capping, dayparting, channel settings, and blacklisting are not factored into your Potential Daily Reach, so the actual number of impressions your campaign receives per day will likely be lower depending on these additional configurations. To increase your volume, try adjusting these settings to be less restricting. Targets and custom bids can also impact your volume, so you can add more targets to broaden the sites that are eligible to serve your ads. Bidding more competitively can also increase your volume. Raise the sliders on your quality tiers to increase your bids for more traffic. If you aren't getting any volume at all, there could be other issues preventing your campaign from running. The Traffic Troubleshooter can identify many of these issues, or you can refer to these tips for other potential problems. TIP: Follow these best targeting practices to increase volume.